Rain falling on the ocean makes a loud and distinctive sound. Individual raindrops make sound under water in two ways. The impact of the raindrop hitting the ocean surface makes the first sound. Following the initial impact, sound can radiate from bubbles trapped under water during the splash. For most raindrops, the sound produced by the bubbles is louder. Raindrops of different sizes produce different sounds. Small raindrops (0.8-1.2 mm) are remarkably loud because they generate bubbles with every splash. They produce sounds between 13–25 kHz. Medium raindrops (1.2-2.0 mm) do not generate bubbles and are therefore surprisingly quiet. Large (2.0-3.5 mm) and very large (>3.5 mm) raindrops trap larger bubbles, which produce sound frequencies as low as 1 kHz. 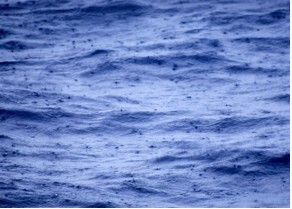 The unique characteristics of the sounds produced by different kinds of rainfall allow scientists to identify and measure raindrop size, rainfall rate, and other features of rainfall over the ocean. Rain is one of the most important components of weather and climate. Improved understanding of the global pattern of rainfall is needed to improve weather and climate forecasting. Information on rainfall over the ocean helps meteorologists, oceanographers, and climatologists. Rain can be a source of underwater noise. Even common occurrences such as heavy rain can increase noise levels by up to 35 underwater dB across a broad range of frequencies (from roughly 1000 Hz to greater than 50,000 Hz) (see: What are common underwater sounds?). Extreme rain events produce very loud signals, sometimes as much as 50 underwater dB above the background noise level.